Soybean oil is extracted from soybeans and is a good source of healthy fats, including omega-3 fatty acids and polyunsaturated fats. 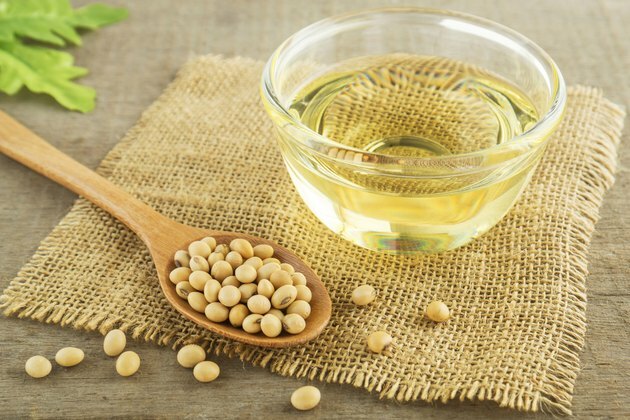 While these types of fats may have several health benefits, soybean oil is still pure fat, which means that eating too much of it can be detrimental for your overall health. When eaten in moderation and in place of unhealthy fats, such as lard, soybean oil can be a healthy addition to your diet. A 1-tablespoon serving of soybean oil has 120 calories per serving and 13.6 grams of total fat. Compared with a 1-tablespoon serving of lard, it has more calories and fat -- lard has 115 calories per serving and 12.8 grams of fat. However, soybean oil is richer in unsaturated fats, containing only 2.1 grams of saturated fat while lard has over 5 grams of saturated fat, almost 40 percent of the total fat content. Soybean oil is especially high in polyunsaturated fat, with 7.9 grams per 1-tablespoon serving, or 58 percent of the total fat content. Polyunsaturated fats are considered healthy for you, especially when they are eaten in place of saturated and trans fats, as they may help lower your bad cholesterol levels. Polyunsaturated fats also contain omega-3 fatty acids, an essential acid that your body isn't able to produce. Omega-3 fatty acids lower inflammation and reduce your risk of arthritis and heart disease, as well as promote brain health and general cognitive function. While soybean oil is full of nutritious fats, it is still a fat and should be consumed only in moderation. The American Heart Association recommends that the majority of your fat intake come from polyunsaturated fats, such as soybean oil. However, no more than 25 to 35 percent of your daily calories should come from fats, including polyunsaturated ones. On a 2,000-calorie-per-day diet, this means no more than approximately 55 to 77 grams of fats per day, or 500 to 700 calories. Soybean oil does not withstand high cooking temperatures well, so it is not a good choice for grilling, roasting or frying foods. However, it works well for gentle sautes of either meat or vegetables -- or even as a marinade for these foods prior to high-heat cooking. Because it has a neutral flavor, soybean oil may not be ideal for salad dressings, unless you want a light flavor. You can use soybean oil in foods that are already highly seasoned -- many ethnic cuisines -- as it will not compete with the flavors of the dish.